Weird parallels from 1982: Is an epic stock rally in store? The only asset classes rallying today… a marijuana milestone in Texas… why one reader doesn’t worry about future Social Security payments… and more! “Rising Trade Barriers Stir Memories of U.S. Depression,” says the headline in The New York Times. “A surge of aggressive economic nationalism, as strong as any in the last half century, threatens to overwhelm the free-trade policies that have underwritten the postwar prosperity of industrialized nations,” the article begins. It goes on to cite a flunky on Capitol Hill who calls the situation “the most dangerous since 1930” — the year the Smoot-Hawley tariffs were signed into law, accelerating the descent into the Great Depression. Heh… The article in question is from June 27, 1982. Hats off to Reason writer Ira Stoll for spotting it. And it’s at this moment we’re compelled to invoke Knuckman’s law: Don’t react to anything Donald Trump says for 48 hours. Give events that much time to shake out. Let’s quickly rewind to Friday: Trump declared the United States would impose a 25% tariff on $50 billion of imports from China. That wasn’t a threat, it wasn’t a late-night tweet, it wasn’t chest-beating. It was actual news. The Dow lost all of 85 points on the day. The Big Board shed another 100 points yesterday — the lingering effects, the mainstream said, from Friday’s decision. Fair enough. After the close yesterday, the president asked his aides to identify a new list of $200 billion in Chinese goods to target for a 10% tariff. Right now, it’s all threats and chest-beating. And yet the Dow is down 300. Overreaction much? “Always wait to see how the market recovers from any snap moves after the headlines break,” says Alan. Here’s the crazy thing: Less than two months after that 1982 New York Times article, the stock market began an epic 18-year bull run. By the summer of 1982, the market had spent 16 years basically going nowhere, the Dow range-bound between 600 and 1,000. And the reality was much worse because of how inflation during the ’70s had ravaged the value of most companies. But on Aug. 12, 1982, the Dow ended the day at 776 — a level that was never to be seen again. 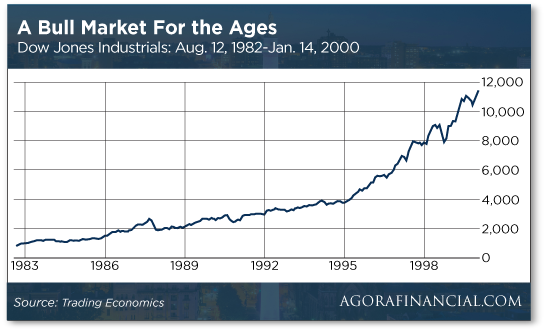 The bull market lasted through Jan. 14, 2000, when the Dow crested at 11,723. Don’t get us wrong: We’re not saying the Dow is on the verge of multiplying 15-fold over the next 18 years. 1982 was the start of a bull market. The current bull market is already nine years old, and the Dow has nearly quadrupled. Could it still get better from here? Even though it’s been nearly five months since the Dow last notched a record close? “Based on the stock market history of the past century, this raging bull market has a long way to run,” says Alan. “Real bull markets can last 12–15 years, producing overall returns of 815–935%. Today’s ‘historic run’ is barely nine years old — and we’re sitting on overall returns in the range of 300% or so. Whelp… Alan just used the b-word there. He’ll be the first to tell you the bubble will eventually burst, as they always do. [Ed. note: For only a few more hours, we’re offering a charter-subscriber discount to Alan’s newest high-end service, Alan Knuckman’s Vertical Fortunes. The only asset classes rallying today are Treasuries and the dollar. The dollar index just punched through the 95 level — territory last seen nearly a year ago. Meanwhile, rising Treasury prices are pushing yields down; the 10-year note is now the lowest all this month at 2.88%. Gold is losing ground, now $1,275. Crude’s run past $65 didn’t last long at all; a barrel of West Texas Intermediate is back to $64.62. Speaking of crude, ministers from the OPEC countries hold their twice-a-year meeting Friday in Vienna… and this is one decision we won’t dare to handicap. Will the cartel raise production levels or leave them where they are? “There are arguments for both sides,” says Zach Scheidt — who’s bullish on many income-producing energy names. Thing is, OPEC’s decisions aren’t the be-all-end-all. “Keep in mind, these meetings only deal with one side of the oil market,” Zach points out — the production side. Demand for oil continues to be very strong both in the U.S. and around the world. Higher demand for oil should help support prices even if production picks up. In any market it’s important to look at the full picture instead of just paying attention to the supply side — or the demand side, for that matter. Either this week or next, the Supreme Court is likely to deliver a blow to small business. As we’ve mentioned a couple of times this year, the court is set to overturn its 1992 Quill decision — under which mail-order catalog businesses are required to charge sales tax only in places where they had a physical “nexus,” like a brick-and-mortar store or warehouse. Quill helped Amazon become the behemoth it is as online retail took off in the quarter-century since. By now Amazon has so many warehouses and distribution centers that it charges sales tax in every state that imposes one. A reversal of Quill would give Amazon a competitive advantage over smaller online businesses: There are 10,814 state and local sales tax jurisdictions across the country. Somebody working out of her home selling trinkets on Etsy doesn’t have the resources to figure out what to charge. And now what might be the most decisive evidence yet of a shift in sentiment on marijuana. During its annual convention in San Antonio last week, the Republican Party of Texas backed the decriminalization of cannabis. The resolution passed with 80% approval. To the mailbag: “I am 78 and on Social Security and would advise people considering when to take it to forget the idea that it will be gone or reduced in the future. “For that to happen the Congress would have to grow a pair but there is no chance of that. The 5: Good point. The checks can be sent out in perpetuity, and the Federal Reserve can simply monetize the debt to cover it. “When the time came to decide about taking Social Security, I waited until 70, to get the highest benefit, and my wife started early at age 62. Along the same lines, “I’m now 73 — I worked till I was 702½ partially out of necessity. “I benefited by waiting, whereas my wife opted to take hers at 62. I was in a fortunate position where my employer asked me to continue working into my 70s full time or even a part-time arrangement, but after 44 years of nine–10-hour days and commuting I decided it was time to take advantage of my health and not let the stress start taking a toll on my life expectancy. The 5: Flattery will get you everywhere. P.S. If you’ve ever thought about subscribing to one of our high-end services… but you just couldn’t pull the trigger because you didn’t think you had enough coin to play the recommendations… please pay attention. Our newest trading service, Alan Knuckman’s Vertical Fortunes, might be our most accessible premium advisory yet. As with all our premium advisories, the risk-reward ratio is amped up compared with our entry-level newsletters. Don’t bet the mortgage money on these trades. Still, with this service, the amount of capital you have to invest shouldn’t be a barrier to entry. And the charter-subscriber rate is still available through midnight tonight. Follow this link to claim your discount.